I’ve long wanted to go hang out in Grand Junction for a long weekend and explore some of the road routes out there. I know the area slightly from passing through it in my kayaking days. And I know it from reading Michael Seeberg’s Road Biking Colorado (updated in 2012) and Kurt Magsamen’s Cycling Colorado’s Mountain Passes. I’ve even talked up the rides with friends, in that “Sh*t cyclists say” way when you’re out on a ride and thinking about other places you want to check out. Long on my list have been the Grand Mesa climb above, the loop through the Colorado National Monument, and the long ride from Whitewater to Gateway. The Grand Valley is fabulous in the Spring and the Fall, especially as the leaves change and the fruit crops come in. And since I am a huge fan of craft apple cider (the slightly alcoholic version), I’m planning a trip this year to check it all out. 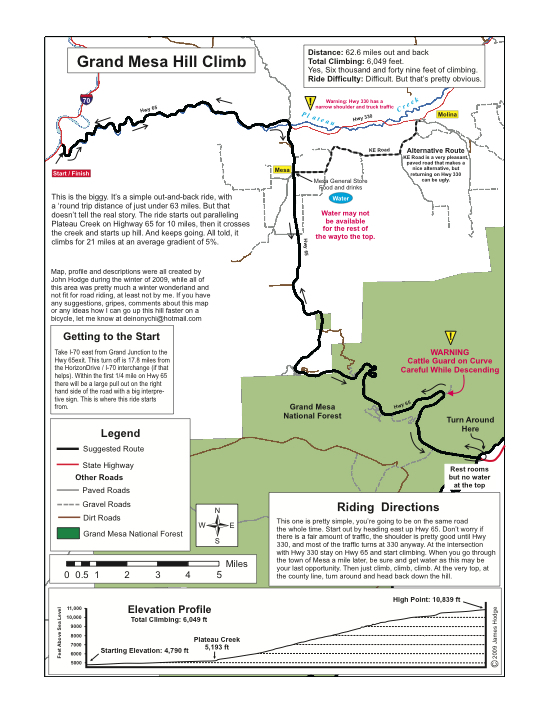 This winter I got in touch with John Hodge, a cyclist and cartographer in Grand Junction, after discovering his Grand Junction Cycling Maps website. We traded emails and he’s graciously allowed me to post a few of the rides in the area here at ColoradoBikeMaps.com. You will find a host of information about road biking in Grand Junction, along the Colorado River, Fruita, Palisades, and Moab. 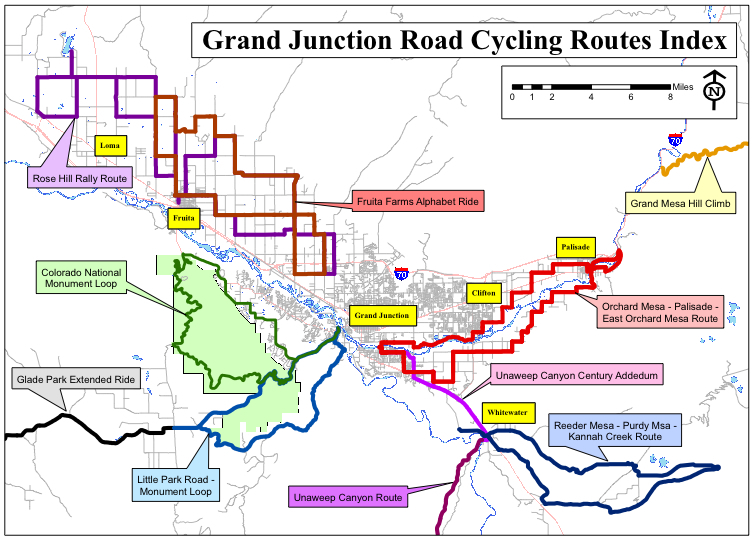 Here’s an overview of some of the Grand Junction cycling options. I like the layout of the maps and may incorporate some of John’s ideas into future maps of my own. They are graphically interesting, have just enough text to satisfy a cyclist’s basic needs, get you to the start of the ride, and incorporate important tidbits like the availability of water and the requirement of head- and taillights in tunnels (Colorado National Monument) and before and after dark (Arches National Park). Visit the site, check it all out, and let John know you’re glad for his time, energy, and enthusiasm for cycling and maps. Follow him on Facebook. And if you’re wondering where I’m headed first with the usual suspects posse, here are the links below. Road in Fruita/Grand Junction last weekend. The Col.Monument ride was great. But on 2 other rides I was severely harassed by locals. On truck full of kids swerved towards me and came so close the side mirror almost hit my head as they drove by and flipped me off and yelled (there was no shoulder on the road but my wheel was on the white line the whole time so not sure what spawned this behavior). The drove by a second time this time just flipping me off. This was on the grand mesa ride. On another ride out of town had another truck nearly hit me passing very close and honking, again I was on the white line. It is one of those situations where these people could have very easily killed me.. I would warn anyone riding in this area to be cautious. Needless to say I will not be going back to Fruita/Grand Junction to ride!